Just this week Mondo made it to the Spiel des Jahres Jury’s Recommendations list, and here’s our review already. Because that is how up to date we are! Well… as nice as that would be, it’s not quite true. Pegasus Spiele had kindly given us a review copy already before that. Which is also nice. Thank you, Pegasus Spiele. So, Mondo. Mondo is a game that many boardgamers, when seeing it on the shelf of their local cardboard emporium, may ignore. There is a bunch of animals on the cover that mark Mondo as a kid’s game. Getting past that and turning the box, these gamers will see that it’s a game where you create landscapes from cardboard tiles. With a timer running. And then they will put it back on the shelf, and it will be their loss because, while Mondo is also a kid’s game, that is only half the truth. The trick is that Mondo comes with three variants of the rules that scale it up from kid’s game all the way to something adult gamers will enjoy. This variant of Mondo is the kids game variant and kids from 8 years upwards, as indicated on the package, won’t have any trouble grasping and playing Mondo like this. But please don’t jump ahead to the advanced game now, all the rules from the basic game still apply there and I won’t be explaining them twice. Mondo starts with each player staring at their own empty game board and a big, unorderly pile of landscape tiles in the centre of the table. The game board shows a grid with a size suspiciously similar to the tiles. I think we all know where this is going. 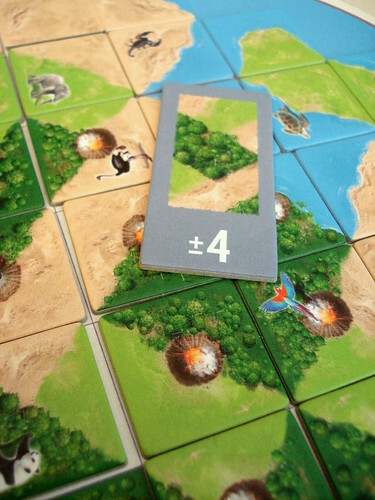 When the timer starts counting – seven minutes in the basic game – all players start searching through the tiles and build a landscape on their game board. Of course, there is some restrictions on how you’re allowed to do that. You can only use one hand and can only pick up one tile at a time. After placing your first tile, all other tiles must be connected to it – you can not start in multiple corners. You may turn a tile any way you want, including flipping it over: all tiles show only one terrain – water, desert, forest or savannah – on the one side, the other side shows two or even three types of terrain. Finally, you may not move a tile once it’s on your board. The rules do not explicitly forbid you from picking up an opponents board and tipping his tiles back into the center; we quickly decided to house-rule that case, though. Putting tiles on a grid is a nice pastime, but not very rewarding in itself: you also want to win. And to win, you count points after the time is up or everyone has passed. (Actually, you don’t count the points in order to win. You count the points and the player with most of them wins.) Counting points is an easy affair, especially in the basic game. 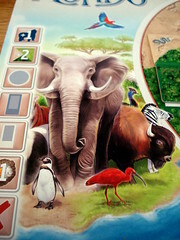 Score one point for every animal on your board – animals come on some of the landscape tiles. Score two points for every completed landscape. To count as completed, there can not be any tiles missing and all the tiles have to match. To do that, you need to have the border all around the landscape on a tile. When the terrain changes from one tile to the next, it counts as not matching, only when it changes on a tile it’s considered a valid border. Water areas do not count as landscapes for scoring purposes – that would be waterscapes. Score bonus points for passing early: the first player to pass gets the number of players in points, each subsequent player to pass one point less. If you played until the timer ran out you didn’t pass and thus get a big fat zero here. The player with the most active volcanoes – volcanoes being another thing that shows up on the tiles – scores negative one for each active volcano. On the second and third round, the player with the highest score counts active and inactive volcanoes; quite a severe handicap. For every non-matching border score negative one. Mind the “per non-matching border” here: a tile that doesn’t match on any side is a depressing -4. This is the reason that passing even when you still have a hole in your world is a tactically sound decision sometimes: you score up to four points for passing early and lose one for the missing tile. Alternatively, you get nothing for playing until the end and then score -4 for putting a completely nonsense tile. All those scores go to the very handy score sheet and are summed up. The score sheet has three columns, and if you don’t believe in coincidences this will reaffirm that belief: Mondo is played in three rounds and the highest overall score wins. The Advances Game: still no award for fjords. The advanced game doesn’t change anything about how the game is played (except cutting one minute of the timer). But on the score sheet there is two lines that were left empty in the basic game: the black and the white iPhone little rectangles. These lines do not in fact reward you for having the most stylish communications device – shocking, I know – but contain the additional scoring for the advanced and expert games. The advanced game uses the dark smartphones little rectangles – actually, the icon is meant to look like the dark scoring card used here. 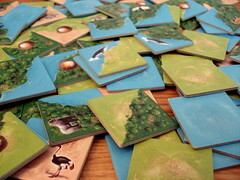 Before each round, one of the five advanced scoring tiles is chosen randomly: they reward the biggest completed forest, the biggest completed inland lake (i.e. not touching the edge of your board, there has to be a coast all round), the most water animals, the most completed lakes or the most completed landscapes with 4 points. They also score -4 points for the player with the smallest forest, smallest lake etc. Finally, the expert game includes everything from the advanced game and then adds another way of scoring. 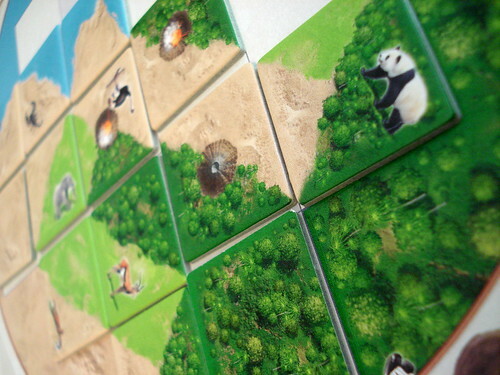 The white expert scoring tiles can award points for having at least three individuals of the same species in one landscape, or for having all four species that can go on that terrain in one landscape, for finishing first, for having no missing tiles and for having no non-matching tiles. That doesn’t sound more difficult (or more interesting, for that matter) than the advanced game, the kicker here is how the white tiles come into play: for each player, two of the white special goals are placed on the table together with the landscape tiles. During the game every player can grab up to two of those special goals and only that player will score points for that goal – or lose points if he didn’t fulfil it. Now it’s suddenly important to watch what the other players are doing. Is anyone collecting buffaloes already? If not, then you might try it. But do you grab the goal early and basically yell at the others “go grab the cows! I’ll lose 9 points if you do!” or do you wait a bit longer just to watch someone else grab the goal tile before you did? And should you concentrate on completing the special goals quickly, running the risk that you will have gaps in your board where nothing will fit at the end? At least you have all the time you could want to make these decisions, the expert game gives you a generous five minutes. Mondo does keep the promise to work for every level of player: the basic game works well for kids and the expert game offers a challenge even to more experienced players – maybe kids would actually have an easier time with this variant as well. There always is an appropriate level of uncertainty whether you’ll be able to finish – especially if you managed to leave a gap that needs the same terrain on three sides because those tiles are exceedingly rare and you never know if they didn’t end up on the bottom side of a tile that was played already. Being able to do some quick math in your head is an advantage here: you’ll want to know if placing that tile that doesn’t match it’s surrounding on two sides, but does finish one more lake and has an animal and an active volcano will end up giving you more points than leaving the space empty. Making that kind of decision on the fly isn’t always easy, but especially with the many different scoring opportunities in the expert game it’s necessary. Mondo is, however, not a game for everyone: you don’t really make any tactical or strategic decisions, there is no long term planing at all. If those are things you’re looking for in a game then this isn’t it. Also there is the timer thing that I know makes some people not want to try a game at all. And some rare people may just consider the theme of building a world and collecting animals too childish. While all those are subjective things to dislike about a game, there is one objective downside as well: Mondo does not scale very well with the number of players. A game in two people, no matter at which level of difficulty, is easier than a game with four people; all the landscape tiles are always in the game, with two players there is less competition for them and much better chances to get the tiles you need. For maximum entertainment, always play in four people. If you’re not put off by the points above and either have three people to play with or enjoy the more relaxed pace of playing with fewer people Mondo is a very entertaining game. Kids will enjoy it for a long time. I expect adult gamers will eventually tire of it, but not for some time at least. And if you do start being bored there is a way to make Mondo fun again: play the expert game, put the timer on three minutes and hide it behind something so no one can see the time left and watch everyone desperately paw through the tiles trying to at least not score in the negatives. Like that it even counts as a spectator sport. There is a solo variant of Mondo as well where you prime the board with some random tiles and then try to complete the board without any mismatches and without any volcanoes – I haven’t tried that variant since I’m not much of a solo player, so we’re not considering it for the score.